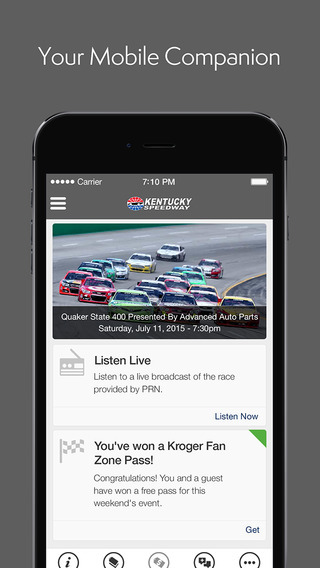 Kentucky Speedway has launched a new app for iPhone and Andriod users that will bring fans even closer to the action. Get all the info you need for race day and every day, plus exclusive content, and personalized offers and experiences. This is just the beginning of a whole new mobile experience to help you find event schedules, driver appearances, maps and much more. We will continue to improve and develop this app to add to the overall experience, so don't forget to check back regularly.